The Sweet Briar Museum maintains a permanent collection of historical decorative arts, photographs, archival documents and publications, clothing, jewelry and memorabilia associated with Sweet Briar — from its founders, administrators, faculty and alumnae to key events in the College’s history. The study of historical artifacts can be an invaluable component of a liberal arts education. It enhances the classroom-based curriculum in disciplines such as history, archaeology and ancient studies, arts management and visual arts. 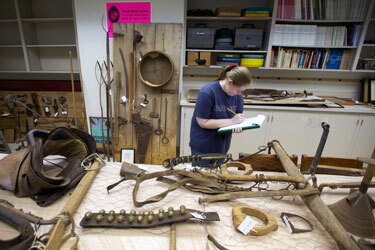 The Sweet Briar Museum provides an ongoing opportunity for students and professors to examine and research original artifacts documenting the College’s rich history. The Sweet Briar Museum, Sweet Briar House and the Slave Cabin are open to visitors by appointment.